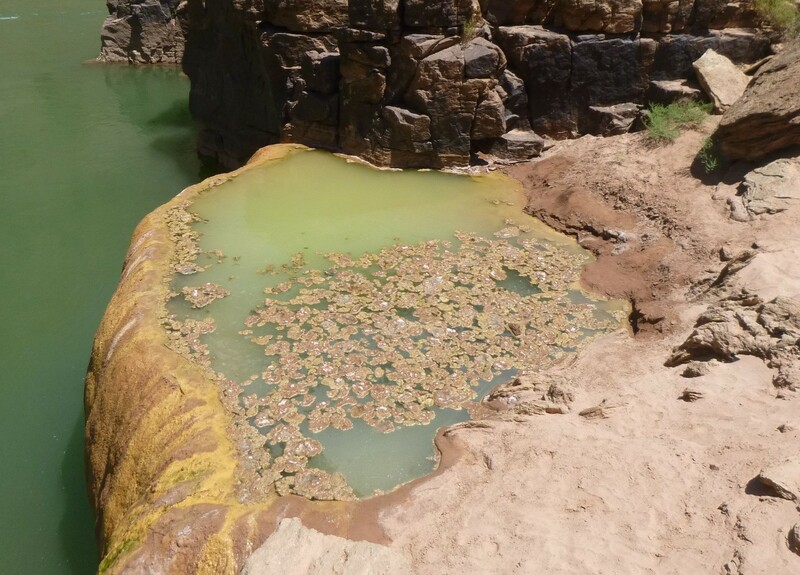 Our Grand Canyon Book tour stopped at Pumpkin Springs, a mineral well on the Colorado River (Mile 212.9) where water from deep in the earth’s crust bubbles to the surface. The water has extremely high levels of arsenic and is also laced with cooper, zinc, lead, and other minerals. The travertine pool formed by these minerals is directly on the river, and as the bitter brew trickles over the rocks, it forms a conical wall that looks like a giant, menacing pumpkin. While we don’t know how Ben & Jerry’s develops its flavors, we do know that they will try almost anything. So we will be happy to share more details about Pumpkin Springs with the company’s research and redevelopment staff if they are interested. Maybe the social mission angle could have something to do with saving the algae, which might have mystical powers? Or maybe poison control? Anyway, guys, it’s just a thought.